This location map is available to download as a PDF or print out here hier. The hotel is situated near the old town in Augsburg and near the city centre. You can get to the town hall (Rathaus) and the tourist information centre in the Rathausplatz in 15 minutes, and the station is just 10 minutes away. Leave the A8 at Exit 72 – Augsburg West and take the B17 towards Augsburg Zentrum / Landsberg a. Lech. After 5 km take the exit for „Zentrum / Pfersee-Nord“. After 200 m, turn left into Bürgermeister-Ackermann-Straße until you reach Holzbachstraße after 1.7 km. Turn left here (behind the bridge). Stay on the B2; after the junction with the A8 Munich you will find yourself on the B17; take the exit for „Zentrum / Pfersee-Nord“. Turn left into Bürgermeister-Ackermann-Straße until you reach Holzbachstraße after 1.7 km. Turn left here. 4. From the south (Füssen), take the B17. Leave the B17 at the Eichleitnerstraße exit and turn right until you get to Gögginger Straße. Turn right here. After 700 m, turn into Rosenaustraße, which intersects with Holzbachstraße after 1.5 km. Turn right here. The ibis budget Augsburg City has plenty of parking space. 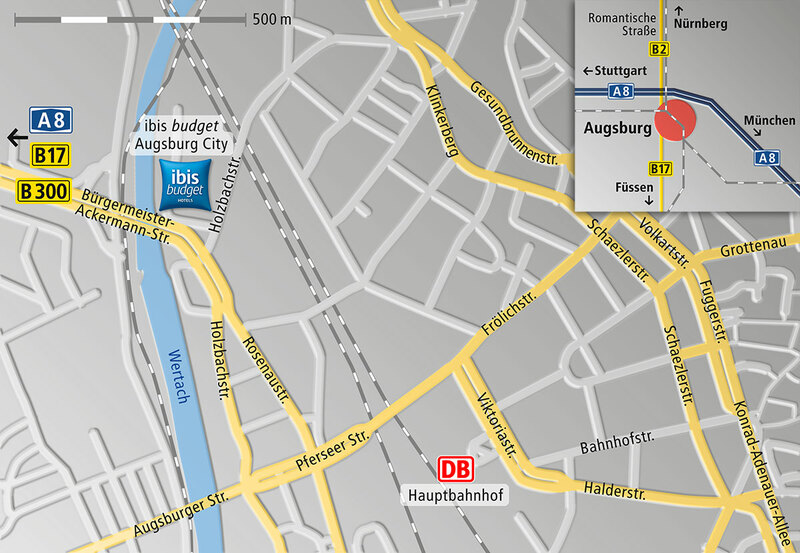 The ibis budget Augsburg City is approx. 1 km from the main station and can be reached on foot in about 15 minutes. From the station, head towards Viktoriastraße, where you turn left; then turn left into Pferseer Straße until you get to Rosenaustraße, where you turn right and carry on to Holzbachstraße. Augsburg has a very well constructed network of cycle routes that criss-cross the inner city (Via Julia, Via Claudia, Donauradwanderweg and Radwanderweg Romantische Straße), enabling you to traverse the inner city safely and easily. Follow the signs for Augsburg Innenstadt or Augsburg Hauptbahnhof. You can get maps of the Augsburg cycle trails in the ADFC cycle map shop (www.fahrradtouren.de).